Libcom.org's reading guide on the events in May 1968 which saw students occupying the universities, intense fighting in the streets and a general wildcat strike of ten million workers across France. Paris: May 1968 - Maurice Brinton's diary - A vivid and exciting eyewitness report by a member of Solidarity on the events in Paris in May 1968. May-June 1968: A Situation Lacking in Workers' Autonomy - Mouvement Communiste - Detailed history and critical analysis of the May-June 1968 movement in France. Obsolete Communism: A Left-Wing Alternative - Daniel and Gabriel Cohn-Bendit - Excellent book on France 1968 by two participants, giving an account of the revolt as well as how it was co-opted with the help of the unions and French Communist Party. 1968 : a chronology of events in France and internationally - Short chronology of the events which swept France in May and June 1968. General Strike: France 1968 - A factory by factory account - Analysis of the development, organisation and end of the mass strike in France 1968, with reference to case studies of particular factories. Impressions of May - Ngo Van Xuyet - Vietnamese revolutionary and émigré working in a Paris metal factory gives his first-hand account of the May 1968 uprising. Enragés and Situationists in the Occupations Movement - An account written in the immediate aftermath of May 1968 of the Situationists' contribution to the Movement of Occupations that took place throughout the country. Parisian Metallurgists in May 1968 - Michael Seidman - Academic article showing how workers acted differently from the way they are usually portrayed in leftist and anarchist accounts of May 1968. May 1968 Documents - Situationist International - Documents produced by the Situationist International or groups the Situationists were involved with during the mass strike and revolt of May 1968. Football to the footballers! - Statement released by the Footballers' Action Committee after they had occupied the headquarters of the French Football Federation. 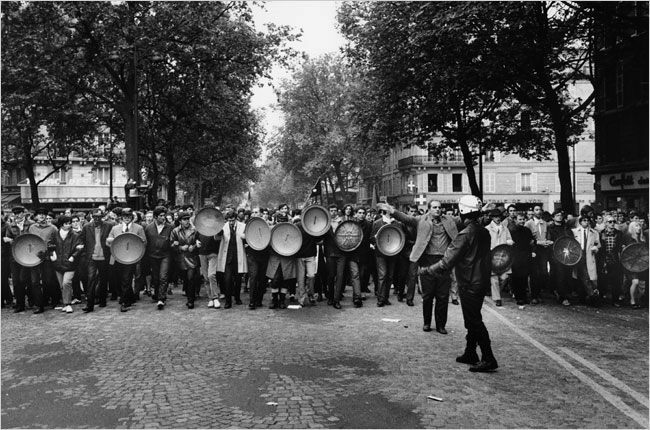 France 1968 photo gallery - Photographs of the uprising and general strike in May 1968 in France. Paris 68 posters - Gallery of posters created during the France 1968 uprising. A tad off, perhaps another posting....any good readings on the 1968 Prague Spring?